There are so many great bike computers that choosing one can be overwhelming. This post about 7 of the best bike computers will help you figure out what works for your needs. It includes a handy comparison chart of the features of each bike computer. These 7 made the list for one of two reasons: either because they are really cheap yet can do the essential functions; or because they offer an impressive range of features. Once you make your choice, please consider clicking through to one of my reputable and trusted affiliates to buy it. It is the only way I can make a little money for the many hours of work I put into these reviews … and it costs you nothing at all – a real win/win situation! For less than twenty dollars you get all of the upgrades above, plus the old standards: current, average, and maximum speed, trip distance, elapsed time, and odometer. Add in simple one-button operation and a universal bracket that you can easily install on your stem or your handlebar – and you have a hands-down best bang for your buck bike computer on the market! CatEye has been around since 1946, and is the global leader in bike computers. They know what they’re doing. The Cateye Velo 9 is wired, but a lot of users find this to be more straight-forward than wireless bike computers. If you insist on wireless, you are going to have to spend a bit more money on one of the other bike computers in our top 7. Update: I previously listed the Garmin Edge 520 as no. 3, but with the release of the Garmin Edge 520 Plus, I have replaced the Edge 520 at no. 3 with the Edge 520 Plus at no. 2. The reason? 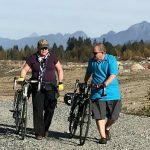 The 520 Plus is an extremely impressive update that makes it pretty much the best GPS bike computer money can buy. That is, if you want true navigation and turn-by-turn instructions as well as premium training features. The Garmin Edge 520 was widely hailed as the biggest leap forward in bike computers, ever, when it came out in 2015. Now it has been updated to something even better, the Garmin Edge 520 Plus. This bike computer is GPS and Glonass-enabled for extremely fast satellite acquisition, and offers wireless transfers of your data to Garmin Connect (or Strava, which you can read about here). It offers advanced performance and power analysis, including Time in Zone, FTP (Functional Threshold Power) tracking, cycling-specific VO2 and recovery and cycling dynamics. It is a rugged bike computer that will stand up to bad weather, and even a fall into water. It will enable you to record your rides, and also offers live tracking – which basically means your spouse can check where you are at any time. It also offers ANT+ connectivity so that you can connect it to other devices, such as a cadence and speed sensor or a heart rate monitor. And on top of all that, unlike the Edge 520, the 520 Plus can actually give you turn-by-turn directions – although not in all circumstances. With the Edge 1030 and 820 you can input addresses while on the bike, and they will calculate the new route for you, and give you turn-by-turn directions. The Edge 520 Plus can only give you turn-by-turn directions for Saved Places, for places found on the included app, Yelp, and for routes that you download beforehand. If you are someone that plans ahead, the 520 Plus offers all you could want in premium cycle training metrics and navigation, at a great price. But if you are more spontaneous, its inability to figure out how to get to new addresses might be a deal breaker for you. (If that is you, see our no. 5 pick, the Garmin Edge 820, which is more expensive – but more capable when it comes to navigation). The Garmin Edge 520 Plus has button control, not touch screen control. I prefer button control. Sometimes I find screen swiping doesn’t work perfectly, especially in the rain- this is in fact a complaint I have heard about in the Garmin Edge 820. Button control gives you complete control, all the time, even with gloves on. The Garmin Edge 520 Plus also has a beautiful color screen, and a great hand-feel – it feels very smooth, light, and high quality. For more about the Garmin Edge 520 Plus, see our comparison of the Garmin Edge 1030 vs 820 vs 520 Plus. 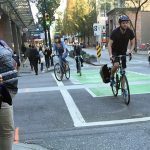 This bike computer is loved by users because it is so easy to use. 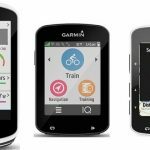 Some would argue that it is far more user friendly than Garmin Edge bike computers, because it channels the mega power of your smart phone. Unlike the Garmin Edge bike computers, with Wahoo you do most of your programming and settings on your phone. Honestly, this is so super easy and incredibly powerful that it made me question all the hours I have spend navigating bike computer menus (and sometimes swearing a bit as I do it). Also, although it is black and white, it is easier to see in bright light than the lovely color Garmin screens. Plus, the zoom buttons on the side are much easier to use than the map zooming menu options on the Edge 820. These buttons can also be used to zoom from 11 sets of data to just 1 or 2. A nice little feature that is not seen on any other bike computers are LED lights at the top of the unit, which you can program to do various cool things! Most notably, if you are following a route – even just a breadcrumbs route – these lights will blink red if you go off course, and blink green when you get back on course. This, combined with how easy it is to see streets on the map, makes the breadcrumb routing actually very useful. Importantly, Wahoo definitely has better battery life – more than double what is found on comparable Garmin units. Note however that if battery life is your primary consideration, you should look at the Edge 1030, which now has a add-on battery pack to extend battery life to 44 hours. Read more here! In terms of connectivity, Garmin has just finally introduced a unit with Bluetooth Smart (aka 4.0) connectivity, its top-of-the-line Edge 1030. Other Garmin units still have only ANT+. However, this little Wahoo ELMNT has both ANT+ and Bluetooth 4.0, for wider connectivity options and lower drain on battery. 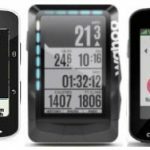 Like the premium Garmin offerings, Wahoo will do pretty much everything you want a bike computer to do, and then seamlessly upload your data to whichever apps you have selected, such as Strava or RideWithGPS. 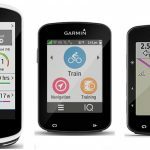 However, it is usually a bit cheaper than comparative Garmin offerings, so it is a great choice for serious athletes who want a great bike computer at a great price. And if you love setting up customized data screens, you are going to have a blast with your phone and this bike computer! Turn-by-turn navigation is not possible on the unit alone, as its maps do not have this metadata loaded. However, it IS possible to get turn-by-turn directions on your Wahoo ELMNT if you export a route that contains the required metadata from an app to your phone. 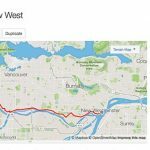 At this time, Strava has that information on created routes, but does not export it. However, if you export a route from RideWithGPS, it will show up on your Wahoo with turn-by-turn directions! The brilliant video below from Shane Miller explains it. I recommend subscribing to Shane’s YouTube channel for lots of great reviews and insights. Garmin Edge 25: small but mighty! You can read a complete review of the Garmin Edge 820 here. 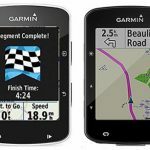 You can read an in-depth comparison of the three top Garmin bike computers here: Garmin Edge 1030 vs 820 vs 520 Plus. The CatEye Strada Wireless Bike Computer is small, light and very affordable, and will do all you want as long as you don’t want to track your rides geographically (it does not have a GPS) or upload your data to analyze. Basically it has a wireless sensor that you put on your fork, and it then calculates your speed, time and distance. While you are cycling, the CatEye Strada will show a whole lot of data, including current, average, and maximum speed, trip distance, second-trip distance, total distance, elapsed time, and the time of day. In testing I found the CatEye Strada touchscreen easy to use. The CatEye Strada bike computer comes with batteries and a universal tool-free FlexTight bracket, and is easy to mount. 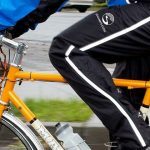 The CatEye Padrone Cycle Computer is a long-time favorite with many cyclists, being a reliable, straightforward wireless bike computer with a huge display. CatEye claims it is the largest display on the market. Add in super lightweight and a battery that will last for a year, and you have a very attractive bike computer at a very affordable price. Also, in response to customer requests, the Padrone has been updated with a stopwatch feature. The CatEye Padrone gets rave reviews from users.